The following is a very basic guide to the steps needed to get started with Revoice Pro. Step-by-step guides are included in each of the linked sections. The first port of call should be our quick online introductions to using Revoice Pro with supported DAWs. Make sure you have installed and authorised Revoice Pro. Revoice Pro is a stand-alone program started by clicking on its program icon. Revoice Pro will first open showing an empty three-track Session. Choose what means of audio monitoring you want to use. Set up Revoice Pro's rendering and background processing options. Load audio into Revoice Pro, either by one of the DAW-specific methods, importing files in stand-alone mode, or using a DAW Link Plug-in. 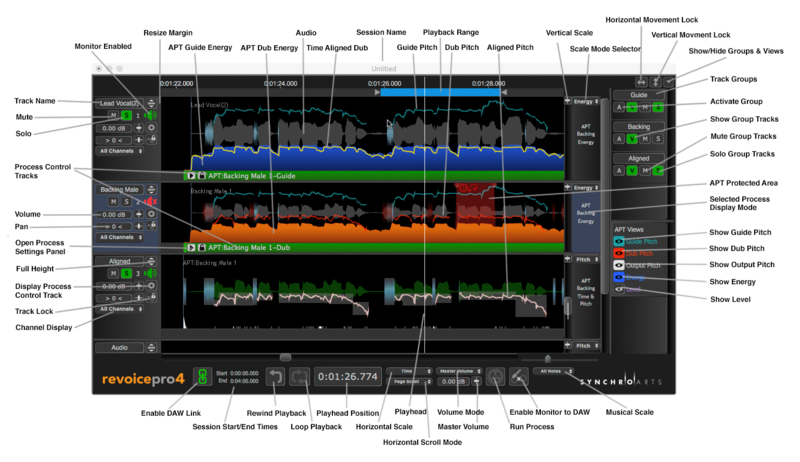 Process the audio by creating and running one of Revoice Pro's Processes. Play back the processed audio to listen and check it. Adjust the Process if necessary by using its Process Control Panel. Export the audio from Revoice Pro, either as a file, or directly to your DAW.